Heat oil a large skillet to medium-high heat and then add your sliced mushrooms & about 2 tsp of salt. Cook till done and remove. Melt the butter in the pan and add the minced garlic. When the garlic begins to brown, add the arborio rice. When the rice begins to toast slightly, add the Bravado Spice Black Garlic & Carolina Reaper Hot Sauce. Mix well. As soon as the hot sauce is incorporated, add half of the stock. Over medium heat, stir the mixture until all the stock has been absorbed, then repeat with the rest of the stock. Cook until the rice is cooked through, but still al dente. Add the grated parmesan & thyme and stir into the rice. 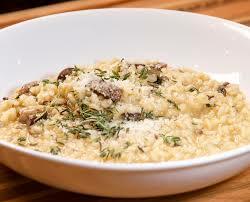 You may also add another tbsp or two of butter for a creamier risotto. Garnish with parmesan & thyme & serve.